ULFO induction coil, 6203431 event marked with white vertical arrow. Schumann Resonances marked on left part. 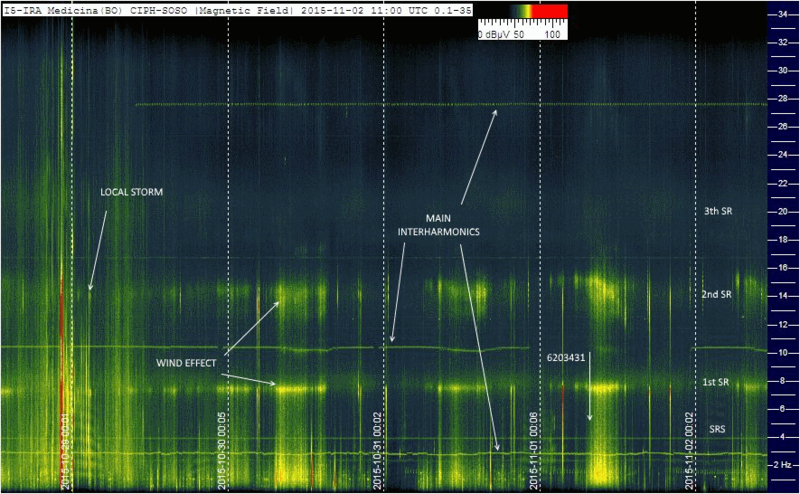 Some interharmonics carriers coming from main lines, microphonic effect caused by wind shaking. No RF signals correlated with earthquake event. ULFO induction coil, hourly strips, 6203431 event marked with white arrow on left bottom. 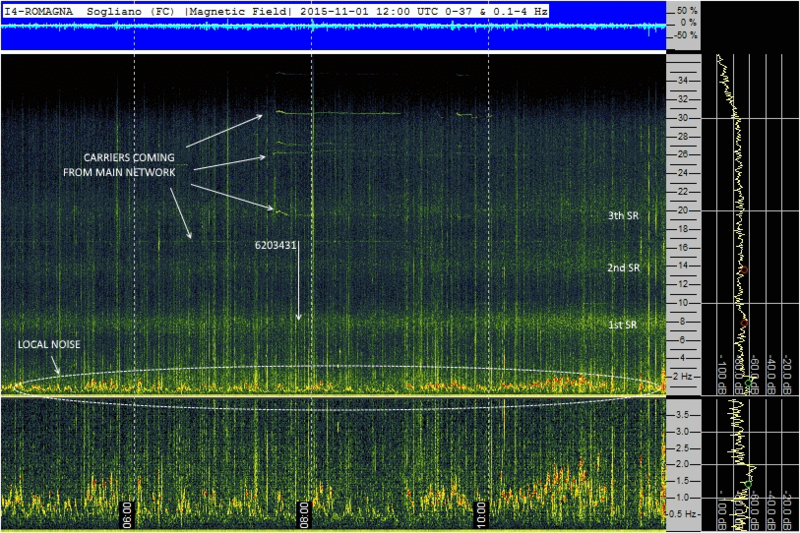 Schumann Resonances on background overcome by microphonic effect caused by wind shaking. No RF signals correlated with earthquake event. Boltek static electric filed, weekly plot, 6203431 event marked with green vertical arrow . No anomalous values correlated with earthquake event. ULFO induction coil, daily strips, 6203431 event marked with white arrow, on top. First Schumann Resonance marked on left part, SRS on october 29, wind shaking effect, almost every day, about at same hours. No RF signals correlated with earthquake event. ULFO induction coil, weekly view, 6203431 event marked with vertical white arrow. 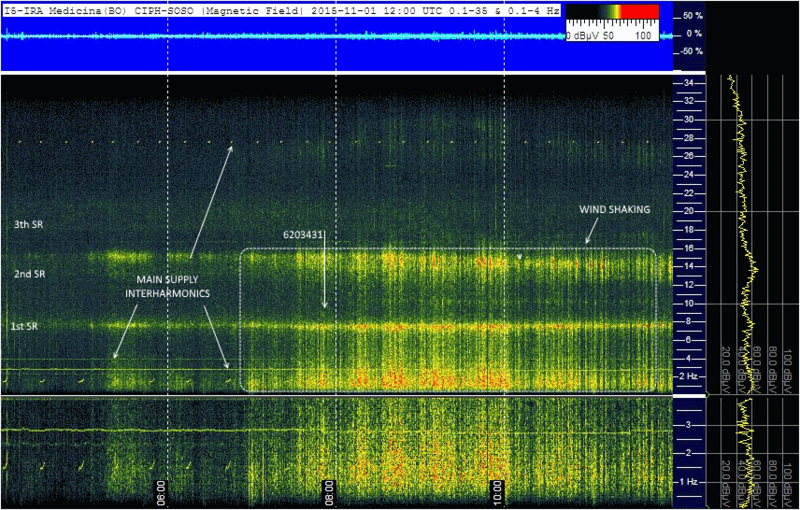 Schumann Resonances marked on right part, SRS, microphonic effect caused by wind, interharmonics carriers coming from main network and a local storm on October 28 . 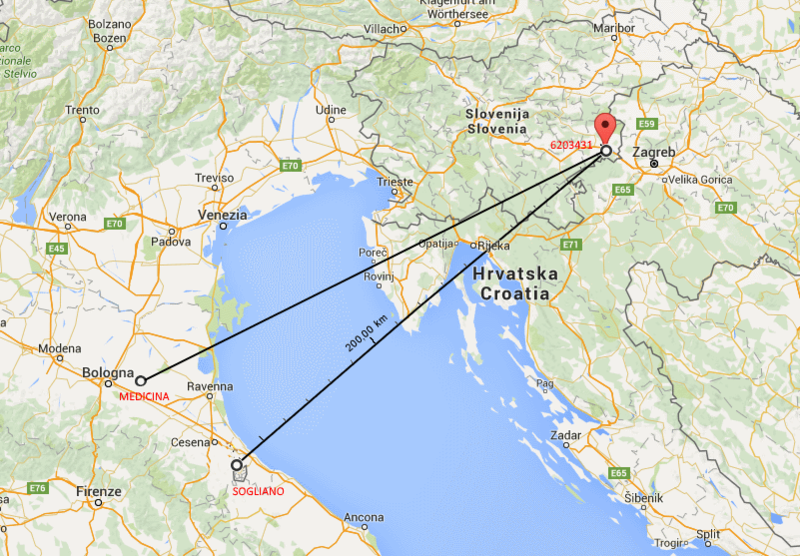 No RF signals or anomalies correlated with earthquake event. ICS101 induction coil, 6203431 event marked with white arrow, on center. 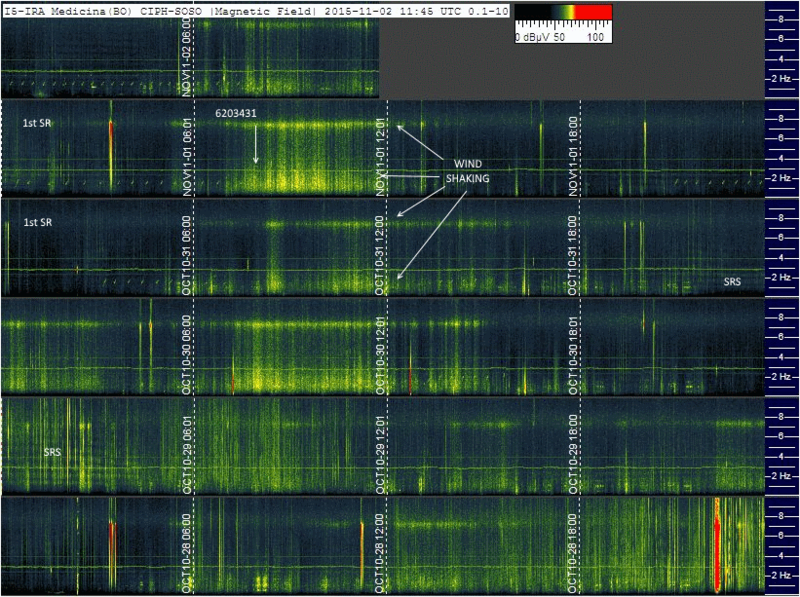 Schumann Resonances on right part, some carriers coming from main network, local noise below 2 Hz. No RF signals correlated with earthquake event. ICS101 induction coil, daily strips, 6203431 event marked with white arrow on top, surrounded by local noise. 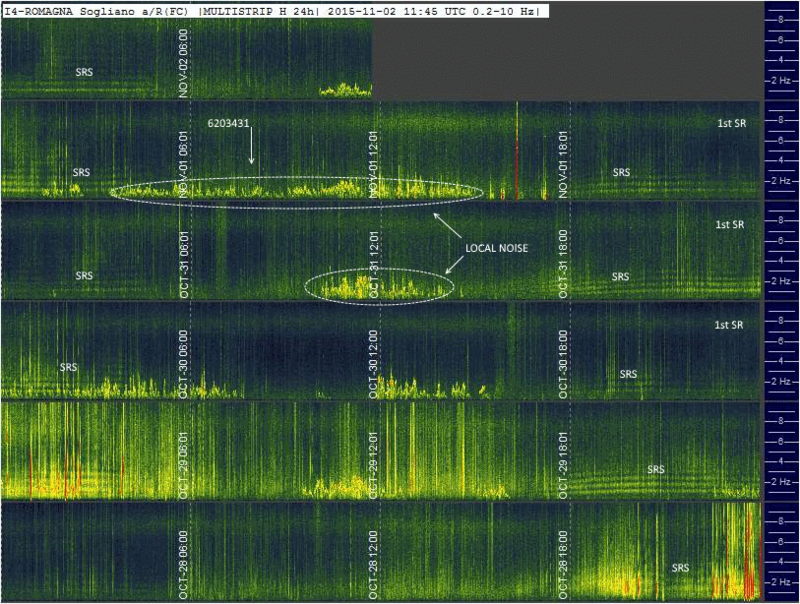 Many SRS, first Schumann resonance marked on right part, a local storm in the night between October 28 and 29 . No anomalous RF signals correlated with earthquake event. ULFO induction coil and Geophone, source wave file analyzed with sonic Visualizer, 8 hours view, 6203431 event marked with vertical green line. Wind shaking effect strong and clear but no RF signals correlated with earthquake event. ICS101 induction coil, source wave file analyzed with sonic Visualizer, 8 hours view, 6203431 event marked with vertical green line. 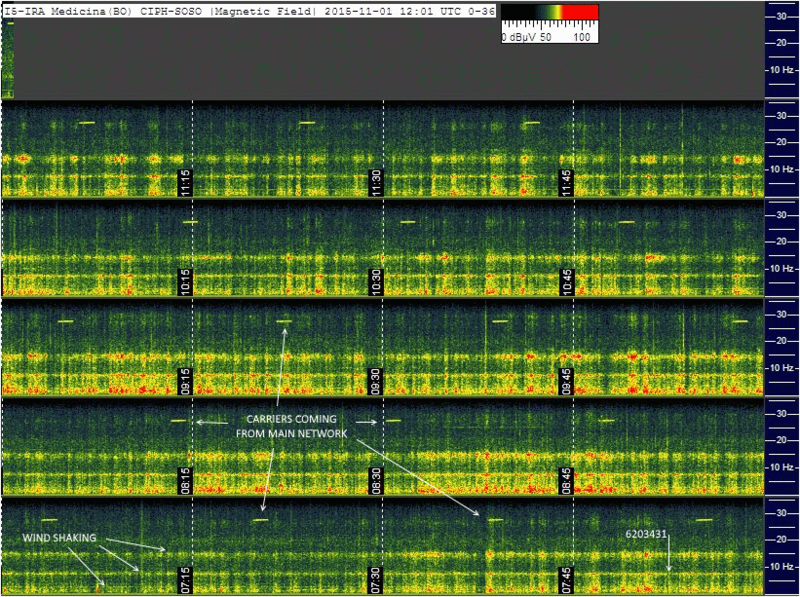 Schumann Resonances marked on right part. No RF signals correlated with earthquake event. ULFO induction coil and Geophone, source wave file analyzed with sonic Visualizer, 25 minutes detail, 6203431 event marked with vertical green line. Wind shaking effect strong and clear but no RF signals correlated with earthquake event. ICS101 induction coil, source wave file analyzed with sonic Visualizer, 25 minutes detail, 6203431 event marked with vertical green line. Schumann Resonances marked on background. No RF signals correlated with earthquake event.